About 60 families ofsharks and their relatives lived during the late Palaeozoic and Mesozoic, but many of these are known only from teeth and spines. 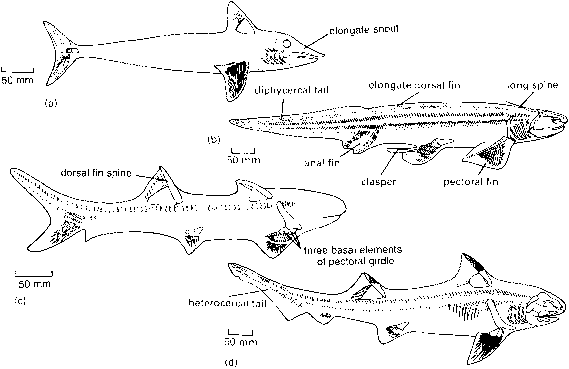 The basal sharks include the Cladoselachidae, such as Cladoselache from the Late Devonian (Figure 3.15), which was surprising ly modern-looking. Recent finds, however, have revealed some quite bizarre chondrichthyans in the Carboniferous (see Box 7.1) and the better known groups of these are reviewed here, as well as their Mesozoic derivatives. The classifications of Gaudin (1991), de Carvalho (1996) and Coates and Sequeira (2001a) are followed. The symmoridans, possibly a clade or possibly para-phyletic (Coates and Sequeira, 2001a), include some unusual early shark families. The symmoriids such as Denaea (Figure 7.1(a)) have a body outline basically like Cladoselache. Denaea has no fin spines and it has a whip-like extension to the pectoral fin called a metapterygial axis. The function of this is uncertain, i.e. whether it was used hydrodynamically,in defence, or in reproductive display. The most striking symmoridans are the falcatids and stethacanthids, two families of Carboniferous spined sharks (see Box 7.1). Falcatus (Lund, 1985), a small shark up to 145mm long (Figure 7.1(b)), looks like a dogfish except that a long shelf-like spine extends from roots deep in the muscles of the 'shoulder' region to run over the head, like a sunshade. The spine is present only in sexually mature males, identified by the presence of pelvic claspers, specialized elements that are inserted into the female during fertilization. Male Falcatus sharks may have aggregated prior to the breeding season in order to carry out display-courtship rituals. Recent studies of Lower Carboniferous rocks in central Scotland (Wood, 1982; Coates and Sequeira, 1998, 2001b) and Montana, USA (Lund, 1985, 1989; Janvier and Lund, 1985) have revealed a wealth of new fossils, often beautifully preserved. The Montana fauna, from the Bear Gulch Limestone (Namurian, c. 325Myr ago), is particularly striking—a world of sharks (see illustration I)! Stethacanthus and Falcatus, with their extraordinary shoulder spines, are the largest. 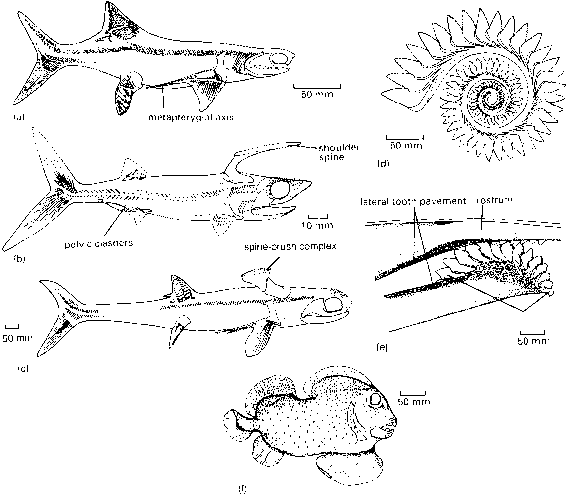 The unusual petalodontiform sharks, such as Belantsea (see Figure 7.1(f)), with their differentiated durophagous dentitions, are also best known here. Harpagofutator, a relative of the subterbranchialian Chondrenchelys, has forked appendages on the forehead, but only in the male. Delphyodontos, a possible early chimaera, seems to have no fins at all and a spherical body covered with small denticles. Another chimaera, Echinochimaera, has denticles in different parts of its body. The male also has pelvic claspers and forehead 'claspers', short spines over the eyes, as in some modern forms. The other Bear Gulch fishes include: a 'telescoped' coelacanth, Allenypterus; a narrow eel-like actinopterygian bony fish, Paratarassius; and the oldest known true lamprey, Hardistiella. The fossils from Montana and Scotland are preserved exquisitely. The Scottish deposit, at Bearsden near Glasgow, contains marine and non-marine beds, and shark fossils were found in both. The deposit was discovered by Stan Wood, a professional collector, in 1981 (Wood, 1982), and it has yielded superb specimens of Akmonistion (see illustration II) and other sharks like those from the Bear Gulch Limestone, as well as numerous palaeoniscoid bony fishes, acanthodians and a coelacanth. Read more about the Bear Gulch fishes and their setting at http://www.sju.edu/research/bear_gulch and the Bearsden Akmonistion at http://www.hunterian.gla.ac.uk/news/archive/shark/shark.shtml and http://www.hunterian.gla.ac.uk/ museum/earth/bear.html. baseplate. The spine is made from dentine, the main constituent of teeth, surrounded by acellular bone. 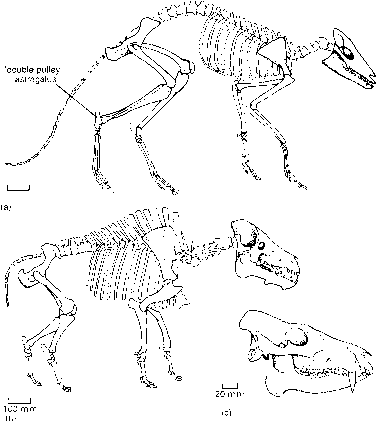 (Figure 7.1(e)) and operates against similar sharp teeth in the upper jaw. The rest of the eugeneodontid skeleton is poorly known, except in Fadenia from the Lower Carboniferous of Scotland (Figure 7.2(a)). This shark has a long dorsal fin and xenacanth dentition. It was a hunting fish that moved through plant-choked swampy ponds in search of prey. The petalodontiforms, from the Carboniferous and Permian, include Janassa from Germany and England, and Belantsea from the Bear Gulch Limestone of Montana, USA (see Box 7.1). Belantsea (Figure 7.1(f)) has an extraordinary bulbous body and a short head (Lund, 1989). There were four powerful ridged teeth set in each jaw segment and the tooth form varies along the jaw. These teeth were arranged as a pavement probably for crushing hard food such as molluscs or corals, and this is indicated also by the armour plates around the mouth, possible guards against abrasion while feeding. are transferred. The claspers contain a number of small hard parts, so they are frequently preserved in fossil sharks. The ctenacanths, an ill-defined group, include many forms dating from the Devonian to the Triassic. They showed a close approach in their fin spines to modern sharks: there are two dorsal fin spines, the fin spines have a pectinate ornament and they are deeply inserted into the muscle mass of the body. Ctenacanthus from the Devonian (Figure 7.2(c)) is poorly known, probably because of preservation problems. The hybodonts may have arisen as early as the Devonian and certainly by the Carboniferous, but their main diversification apparently occurred in the Triassic and these were the dominant sharks in the Jurassic of Europe and North America. The hybodonts survived into the Late Cretaceous side-by-side with the modern sharks, the neoselachians (see pages 164-9). Typical hybodonts, such as Hybodus (Figure 7.2(d)), were probably sluggish swimmers, but capable of short fast bursts of speed on occasion. The paired fins were used for steering and stabilization. The tail is fully hete-rocercal, with the backbone bending upwards. Hy-bodonts have a number of tooth shapes, some high and pointed and others low, which suggests that they fed on a variety of prey types, ranging from fishes to bottom-living crustaceans. They were essentially a marine group, like all sharks, but some species became adapted to life in fresh waters. gium at the back, as seen in other Palaeozoic sharks, and a mesopterygium and propterygium in front. The chondrichthyans so far described are known largely from the Carboniferous and Permian periods, but another clade that originated in the Devonian and radiated in the Carboniferous, the subterbranchialians, still survives today. The Subclass Subterbranchialia includes two extinct groups from the Carboniferous, the orders Iniopterygiformes and Chondrenchelyiformes, as well as the extant Superorder Holocephali, the chi-maeras or ratfishes (Stahl, 1999). The iniopterygiforms Sibyrhynchus and Iniopteryx from the Upper Carboniferous of midwestern USA (Figure 7.3(a, b)) have large heads, very long pectoral fins and rounded tail fins (Zangerl and Case, 1973). The pectoral fins are attached to the pectoral girdle in a very high position and they probably flapped up and down like the wings of a bird, much as in a modern chimaera. The front of the fin bears a series of hook-like denticles. The chondrenchelyiform Chondrenchelys from the Lower Carboniferous of Scotland (Figure 7.3(c)) has a long , eel-like body with no tail fin and a small skull in which the palatoquadrate is firmly fused to the brain-case (see p. 54). The pelvic fin is small and males have claspers. Typical chimaeras of modern form appeared in the Jurassic, although there are some tantalizing relatives from the Carboniferous.An example is Helodus (Figure 7.3(d)), known from freshwater sediments of Europe, which has the fins and jaws of a chimaeroid, but has a number of small teeth and a heterocercal tail. Later chimaeras simplified their dentition to a small number of broad tooth plates, typically two pairs in the upper jaw and one pair in the lower jaw, used for crushing hard food such as molluscs and crustaceans. This pattern is approached in Deltoptychius, also from the Carboniferous (Figure 7.3(e)). Later chimaeras had pointed tails, sometimes called 'rat tails', unlike the more generalized shark-like Helodus. An example is Ischyodus from the Middle Jurassic of Europe (Figure 7.3(f)), which is essentially the same in appearance as modern chimaeras. The skull is small and its elements are heavily fused, the gills lie beneath the braincase and there are two pairs of tooth plates in the upper jaw and one pair in the lower. The tail is long and whip-like, the pectoral fins are large and the tall spine in front of the dorsal fin may have borne a poison gland as in some modern forms.